The image above is from a driver awareness campaign I’ve started based on data from NHTSA on distracted driving. There are countless campaigns targeting cell phones and texting, but very few target a true killer when it comes to distracted driving – inattentiveness. Under the table Attributes Included in “Driver Distracted” by Element NHTSA provides data on the cause of distraction for each fatal crash. It’s important to note that two factors can apply to a single driver. For example, if a driver is eating and texting during a crash this would be recorded as two different factors. This is where the math and data start to become unclear and do very little to inform on the causes of distraction. 1,398 or 44% of total distracted driving factors were Not Reported. This means that distracted was noted in the Police Activity Report, but doesn’t specify the distraction factor. All of these cases could be texting or they could all be day dreaming. No one really knows. Think about that for a minute. Almost half of the data on distracted driving doesn’t go beyond simply saying distracted. 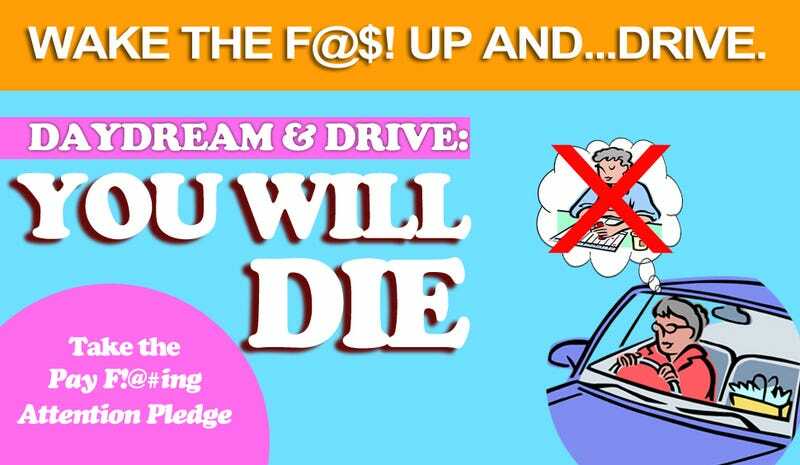 586 or 19% of total distracted driving factors are Inattentive / Lost in thought. This means the driver stopped paying attention. Reports have described this as simply “daydreaming” behind the wheel. The second largest menace in the world of distracted driving, second only to the overly inflated catch-all category above is people tuning out. 267 or 8% of total distracted driving factors are Other Distraction. Yes, that’s correct. The third largest factor of distracted driving is yet another catch-all category. 39 or 1% of total distracted driving factors are Dialing or Text messaging. One would assume this number would be much larger, but it isn’t. There is a caveat. NHTSA continues to improve on how it captures information regarding cell phone use in fatality reporting. There are two additional categories that involve cell phone use. One is Other Cellular and accounted for 218 or 7%. According to the table this designation is used when there are no specific details given about the cell phone, but indicates it may have distracted the driver such as dropping or reaching for the phone. Also in a separate category is Talking or Listening on a cell phone. This comes in at 114 or 4%. If you combine the three categories that are cell phone-related it comes to – 371 or 12%. While many of the campaigns in the public for distracted driving awareness has focused on texting, you can see that texting, at least according to NHTSA, is less than 1% of the total fatalities under distracted driving and is 0.1% of total fatalities (39 of 32, 367). There appears to be a common theme here – the data NHTSA uses regarding distracted driving is limited and imprecise. The data has to improve to better inform policy makers and/or safety advocates to produce campaigns or policies that are effective in targeting and combating a specific distracted driving behavior. How would police officers enforce state laws against daydreaming? What technology could NHTSA force automakers to install that would make them focus on driving? People who drink and drive or text and drive are self-aware of their actions. They choose to drink or choose to text. People don't choose to daydream or become inattentive. And that is what makes distracted driving challenging for regulators and safety advocates. The true answer to this riddle of human behavior might be active crash avoidance. Maybe its time automakers put aside fantasies of autonomous cars and focused on the wide scale proliferation of optional active crash avoidance systems. I'll rest better knowing that the 5,000lb SUV barreling up behind me at 55 in a 35 has a system in place that should I come to a stop, its stopping won’t rely on the person in the driver’s seat staring out the window thinking about what to cook for dinner.